Find a vacation home to rent in Naustdal Municipality from our list of vacation rental properties. Campaya has over 5 vacation homes available in Naustdal Municipality, which give you the possibility to locate a unique accommodation in Naustdal Municipality which completes your check-list in search for the perfect self catering vacation apartments in Naustdal Municipality or vacation villas in Naustdal Municipality. Cozy, beautifully situated holiday home in a small village by Førdefjorden i Naustdal. The holiday house is situated in a lush landscape with a lovely view over the fjord. Welcome to this great holiday house who formerly was a farmhouse. The view from the house will take your breath away. A small holiday paradise located on an island in Nesvatnet. For those who are interested in fishing this is a perfect place to stay. Nesvatnet can offer both trout and garyling. 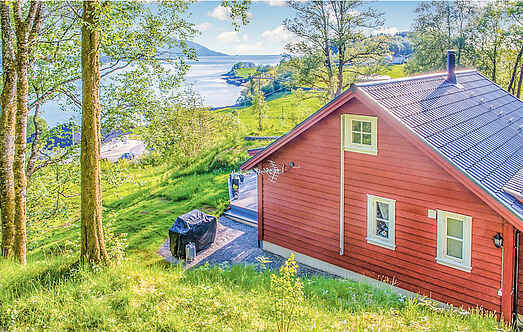 This great holiday home on the waterfront is located in Naustdal in Sunnfjord. The house maintains good quality consistently. Under floor heating is available in every room.